Watching Robert Edwards compere a squash tournament always reminds me of a Catholic wedding I once went to: a somewhat fussy ceremony spun out over a couple of hours, presided over by a man who knew what was best. 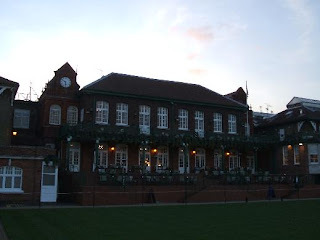 I came to Queen's Club on the last night agnostic to the claims that the event would herald the new dawn squash has been waiting for. Happily, I am pleased to report that Mr Edwards earned his fee here at this year's Super Series Finals, investing the new venue and the presence of a HRH with a greater sense of occasion than Broadgate ever received. His style may not be to everyone's taste, but it felt right on this night, in these hallowed surroundings. Was this also because we were in posh Kensington rather than stuck behind an All Bar One in Liverpool Street? Or was it down to the new marketing and PR that were brought in by Ziad Al-Turki? The congregation at the last night night of this year's Super Series Finals was a broader church than we're used to seeing at this annual event, with the blue blazers of Queen's Club replacing City pinstripes. The organisers had also pulled off a coup in getting HRH The Duchess of Gloucester to attend the final night. 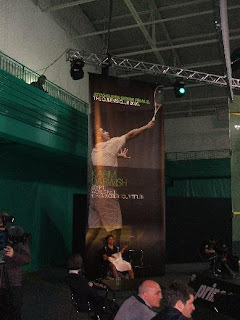 The venue itself was a couple of indoor tennis courts modified into the usual iSport set-up, with a large backwall seating area and two sidewall areas with round tables and unreserved seating. This is where I sat, after registering with the helpful iSport and Greenspace (the brand consultancy brought in by Ziad Al-Turki) staff. I found my way to these seats after one of the (contracted out?) security guys bluntly told me, arms folded, when I potitely enquired about a media seating area, that the seats were all sold-out. Fair enough, but the event could have done without their glowering at the crowd as if it was a football terrace. Karim Darwish treated his third place play-off against Shabana with his serious face on, and we weren't going to see the repeated boast-and-lob showmanship that this precursor to the final has prompted in previous years. Oh well - he is currently the best player on the planet, and we can't begrudge him from wanting to win everything. What we could have done with after what felt like somewhat of a practice-match was a good knock-around doubles exhibition. Where was John White when you needed him? Always a favourite at this event and others in the UK, I have fond memories of him entertaining the crowd not only through his natural instinct as a player in competition, but also in various exhibitions at big events, and we could have done with him here to get the crowd going at half-time. 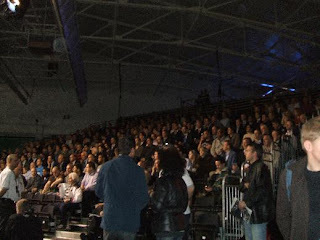 I notice that doubles exhibitions have become unfashionable in recent years at tournaments in the UK. It would be sad if this was part of a wider drive to demonstrate professionalism in the run up to the 2016 vote. At some events the time when the crowd has been most engaged or captivated with the players is during a four-man lark around, and it's important to show that the game is also a lot of fun too. I hate to see any empty court that usually hastens the natural instincts of spectators to toddle off to the bar. Perhaps if the court were filled in 'transtition' periods if might give the opportunity to demonstrate what else squash has to offer, such as junior talent or some of the WISPA pros (rarely seen in London). 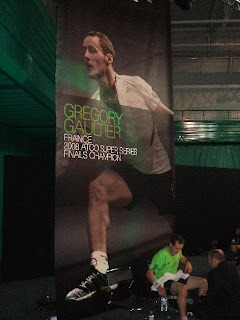 If Greg Gaultier continues to demonstrate the form that was on display tonight, he is going to be a favourite for Canary Wharf - and may soon challenge the top two Egyptians for the number one spot. Strangely the mood of evening actually lightened during the final, as the Queen's crowd unfamiliar with Gaultier's gesticulating started to warm to him (though I did nearly have to cover my eyes as he stepped out of court to remonstrate with the officals right in front of the Duchess's lap). Lincou still conducts himself on court with the professionlism that has characterised his career, but while he appeared tonight as alert and focussed as ever, he is not quite as quick as he was, and was always half a pace behind his younger countryman tonight who was poised on his shoulder throughout. Gaultier took control from the beginning, relentlessly putting Lincou to the back of the court before dropping with consistent accuracy. Former World Champion Lincou really did not look like he wanted to spend the whole night banished to the back wall, and raised his game in the second to start imposing some control on rallies. With the match levelled at 1-1, Gaultier was spoiling for a fight with the officials. Given that this event and Canary Wharf are stated showpieces for the sport in its Olympic bid (the matches this evening were filmed from a number of different angles), this would not have gone down very well, but either due to Gaultier'a self-restraint or the strong words from the officials, a lid was kept on things. It was during the assessment of the 2002 Commonwealth Games in Manchester that is was noted by the IOC that squash has a problem with players too easily remonstrating with officals. It is all too easy to blame the player in these situations, but clearly the officals need to be held accountable too. In the Shabana v Darwish game earlier in the evening there was at least one occasion when both players had exited the court door to tell the officals what the decision was before any decision had been made. This would not happen in tennis, and the Queen's Club members watching tonight would have noted this difference. Really pleased as well to see that people sat in their seats at the end to see the presentation and hear the interviews - something that rarely happens. Maybe this was out of respect for our VIP (and the Duchess) - Mr Edwards was certainly very persuasive in preventing people from going home early. If the Queen's Club is to hold this tournament in subsequent years I can see it turning into a kind of Lord's of squash, contrasting with the more lively Edgbaston of the Canary Wharf event (watch the Ashes crowds this summer and you'll see what I mean!). The sport needs both, and there is room for provision to be made to further foster inclusion for even more divergent audiences. This week's experiment at Queen's Club appeared to be a success, but there will be some who say that squash needs to break away from the private members clubs of old. The fact is that squash cannot afford to choose its audience, and it needs the support, patronage, and facilities of places such as Queen's. 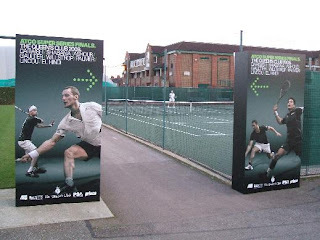 It also needs to attract the working class kid in east London, and maybe some of the 'urban' initiatives (that seek to change squash's image as well as where it is played) are the way to go. The portability of the sport is a huge advantage in trying to appeal to these different audiences, and other changes such as the re-organisation of the PSA tour to move region-by-region (as suggested by Mr Al-Turki) would certainly help put the sport on people's radars for longer concentrated periods. Had I just witnessed '21st Century Squash'? Not sure about that. The design of the advertising, marketing and PR materials (all contributing to the brand) looked very good, particularly some of the merchandise that was given out (there was a very nice fold-out map of London squash clubs). To some extent this modern, minimalist design was maybe slightly divergent from the austere feel of the Queen's Club, and would have contributed to a greater overall impression at a more left-field venue. But these materials were well produced, and some thinking had obviously gone into them. National media coverage - the efforts of Rod Gilmour at the Telegraph aside - was sadly again almost non-existent. In terms of the more practical elements of the event: the format of the evening was pretty much similar to the British Nationals, the World Open or many other of the pro events I have attended over the past years. Loud music pumped out, nice introductions for the players, interviews afterwards. A feature that was here at Queen's but is not always seen at big events are the large video replay screens. These worked very well here tonight, with the crowd fixated on them between points. These should now become a benchmark standard feature, but organisers must ensure that the players or spectators do not manipulate the officals into using them to make decisions. The position of the officals in the crowd in squash make this an awkward possibility. This was perhaps not the most entertaining Super Series finals night that I have been to, but it was certainly a step up a level to further cement itself as a 'big tournament' (a rather elusive phrase - much like a 'big club' in football - not necessarily down to the money floating around or the number of people who go and watch it). It never really felt like this down in the tent at Broadgate. At the end of the day maybe there is only so much you can do with a bunch of people sitting watching two guys in a goldfish bowl. Maybe the true value of '21st Century Squash' is the plurality of experience that different squash venues can offer when they all adopt a benchmark for marketing, technology, design and all the other little things that go into creating a spectator experience. The true value of the game as a spectator sport competing for fans might only be realised if a punter can watch the game in a city square one week and on a beach the next. 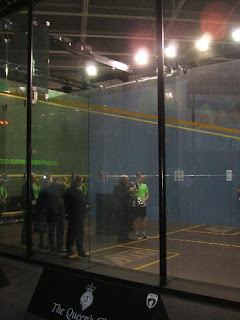 I was at the two semi's last night - great squash, fantastic comebacks and wonderful venue. My only concern is that the push to become an Olympic sport will highlight the poor understanding of the rules. Today's super fit players can get every ball back and they think they should get a let for everything. In one long rally Gaultier went the wrong way, spun round, took out Palmer and then asked for a let - no! NO LET but he got a let. He made his own interference. But the audience don't know either. Poor shots should get punished. Hit a ball down the middle onto your opponent's racket then you should have to run around him - not get a simple let. As a new Olympic sport we could cause headlines for the wrong reasons. Remember the martial arts and the British girl who clearly kicked her opponent? I would go as far as painting the floor into boxes - hit a ball into the centre box and then you won't get a let for simple interference.